[top]: Anonymous: Edward VI and the Pope, an Allegory of Reformation, mirrored view (16th century, NPG 4165). Iconoclasm depicted in the window. Under the “window” 3rd from left is Thomas Cranmer who wrote the 42 Articles in 1552. [bottom]: Philip Galle after Maarten van Heemskerck, redrawn (vectorized) print Ahasuerus consulting the records (1564). 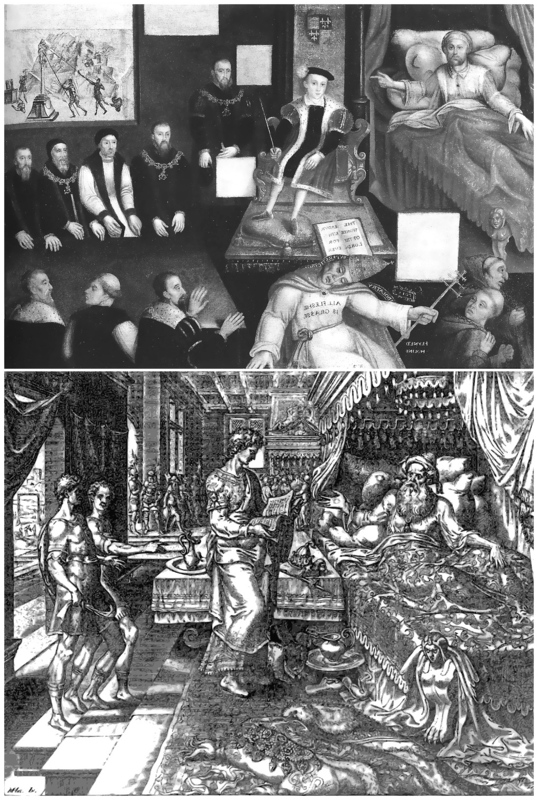 The resemblance to the upper image was shown by Dr. Margaret Aston in 1994 in The King’s Bedpost: Reformation and Iconography in a Tudor Group Portrait (p. 68). She also compared the bedpost to Heemskerck’s Esther Crowned by Ahasuerus.